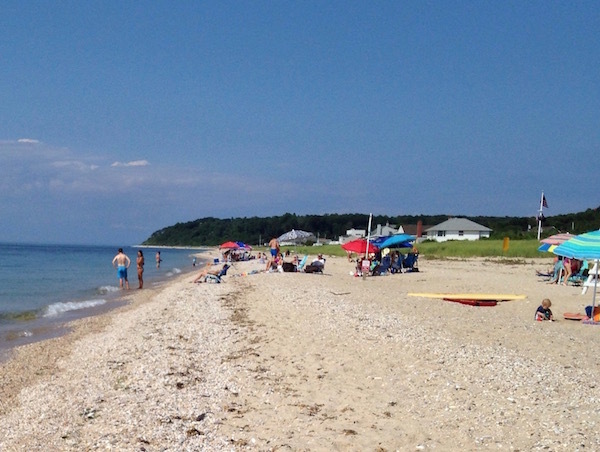 On the North Fork, we have the amazing rocky Sound, and the sandy Bay. They are both almost complete opposites, so that would mean they attract different kinds of visitors. My theory is that parents would most likely want to have the pleasure of going to the Bay, so their children can play with the sand. But I should keep an open mind, because that might not be the case. The Sound is mostly rocks and pebbles and you could only imagine the pictures tourists would like to take, with the view of Connecticut and the beautiful shiny waters in the background. What kind of people would like to visit the Sound? I asked many people the same questions and got numerous answers, some of which I certainly didn’t expect. Down near Kenney’s Beach, most people said it feels bigger and stretches out longer then the Bay beaches they have been to, but almost everybody complains that the rocks hurt their feet. Although that may be true, most people I spoke to still like the Sound better. A group of five people who were visiting told me they chose the Sound because they feel it is better for relaxing on the less muddy ground, swimming in the clearer water and skipping rocks in a competition. A smaller family of three, local to the area, enjoy swimming in the cooler water and big waves because it resembles an ocean. Kayaking is also an activity locals enjoy taking part in on a hot day. Another small family told me hanging out, swimming, and spending time with family is most enjoyable at the Sound because, like others, they agree that the Bay feels muddier and dirtier. Founders Landing on the Bay is a great place to have fun in the sun. Not a bad thing was said about it. With the swings and slide it’s hard for children to get bored. 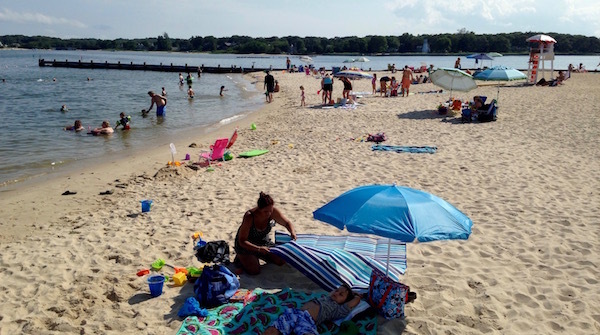 Two women sitting at a picnic table told me they are vacationing for the summer in Southold and that they love the Bay for the clean restrooms and playground. They agree that swimming in the warmer water of the Bay and finding shells in the sand are more pleasurable here, rather than at the Sound. Another lady who came with her child had more to say about the Bay than anyone. The Bay is walking distance from her house, which makes it convenient to go there, swim in the warmer water, and hop on the boat with the whole family when her father drives by. Her children enjoy playing on the playground, finding crabs, and playing with sand toys. For a clumsy tween, the experience of the Bay is different, but by far the most interesting to me because I can relate to her. She tells me it’s better to spend a lovely day at the Bay with friends than anywhere else. Water is the perfect temperature to not be bothered by too many jellyfish or to be too cold to swim. Kayaking around, digging holes, playing games and relaxing are most of the activities she enjoys taking part in at the beach. One of the main reasons the Bay is better for her is because it’s harder to get injured on sand, unlike the slippery rocks. Even though both beaches are completely different, they’re both fit for a perfect day of swimming and activities such as kayaking with family or friends. The sand will always be there for digging holes, making sand castles and the two sunsets will look just as beautiful for pictures. ← So You Want To Build a Cardboard Boat? Have You Gone Daft?